In my time with PUPI, formally known as Private, Unaffiliated Paranormal Investigations, I’ve seen a lot. Learned a lot. And not all of it’s been good. But what we do—make people accountable for crimes committed with magic—is important work. Still. Even I need to take a break every now and again. Or so I’ve just been told (ordered). So hey, vacation. Maybe I’ll finally figure out what’s going on with the “special bond” between me and the bossman, Benjamin Venec. Venec seems to like that idea—he’s invited me down to join him on a jaunt to Philly. But no sooner do I arrive in the City of Brotherly Love than we’re called in to look at a dead body. I love Bonita 'Bonnie' Torres. She doesn't have a lot of diplomacy but that means that you know exactly where you stand with her. She straddles the line between being Council and being a lonejack as well as being a pup. She is also a perfectionist and will do almost anything to get the job done. DRAGON JUSTICE is what I can brain candy. It is the perfect book to curl up with and let the storytelling carry you away. It is well written and there is nothing, well except for the need to sleep, that pulls you away from the world Ms.Gilman has created. The characters, most of who you meet in earlier books, are well developed. I was very happy to see that Bonnie and Ben are finally starting to pay attention to the huge white elephant that's in the room with them and discovering that it does have its good sides. We are also given more glimpses of what causes the other Pups to tick. Some of them would be very mentors when the time comes. The case that comes up when Bonnie tries to take a vacation is deeper and darker then the PUPI norm yet watching the pack work together is a true joy. And it keeps the readers on their toes as they discover more information. DRAGON JUSTICE is a great addition to the Paranormal Scene Investigation series and I can hardly wait to see what the next book holds. 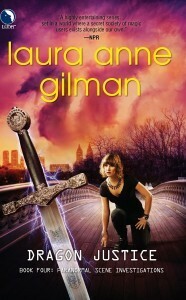 I recommend this book to any readers who enjoy urban fantasy. I rate this book a 3.75. 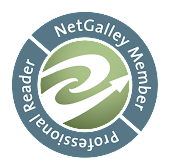 *** I did receive this book from NetGalley in exchange for a fair and honest review. No money exchanged hands and all opinions are my own.